The World's Most Expensive Yerba? 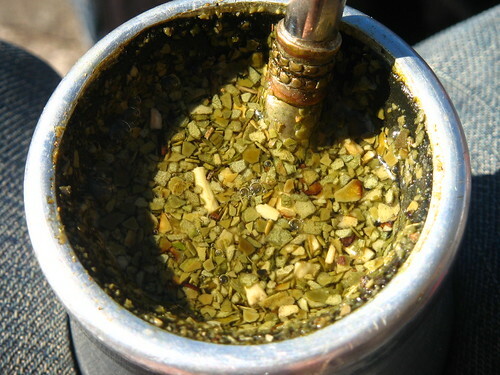 We always bring yerba mate back from Buenos Aires. It has become another habit as a biproduct of the passion for tango. Everywhere you will see porteños with their little thermoses and the cup with a metal straw, the bombilla, sipping away. In the queue, in the park, on the bus, in tango classes etc etc. Anyway — we ran out of the stuff after a couple of months after our return, and went to the specialist tea and coffee store in town. And got what must be the most expensive yerba mate the earth has ever seen. In Buenos Aires, it is really cheap, and often associated with lower social classes, somewhere between fifty cent and a dollar a package (500g). The supermarkets got millions of brands, and everybody got their favorite yerba. In out tea store they got one kind. And 500g cost about $20. And it didn’t really taste that good, no idea what brand it is. I should go there and ask if they know how it is used, it is priced the same as black/green tea, of which one uses but a small fraction of the amount for each serving compared with the preparation of a mate. Since we’re not planning on going back soon, the solution will have to be found on the internet. Not as cheap as in the supermercado, of course, but more reasonable priced. Anyone got a tip for a good store that ships to Europe and carries Cruz de Malta and Rosamonte?